The latest (1999) TALGO-hauling diesel locomotive, recently developed in Germany and Spain, uses LED-based head and rear lights. The headlights are actually a multi-LED display yielding white light; the rear lights are ordinary high-power red lights. Efficient blue LEDs -and lasers- have been available only recently, using Gallium Nitride as base material. The key point is that blue is necessary to get white light from LEDs -by mixing red, green and blue LED-emmited beams (as in TV). We lacked the blue ones until recently. Instead of using these multiLED structures, another way of getting white light is employing ONLY a blue LED which in turn emits its light onto a kind of phosphorescent layer. The latter becomes excited and happens to emit white light. I think most of the the "white LED" devices they are already selling use this technique, but I've heard the light is actually slightly bluish... The white LEDs of the TALGO loco seem to be true white multiLED. 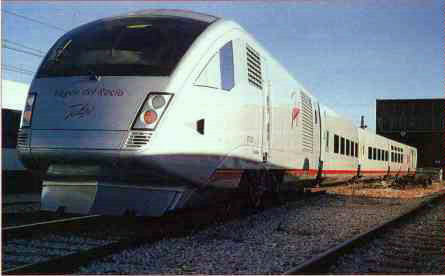 Talgo's white LED lights are just clearance lights ("position lights," as we would say [a/k/a "marker lights"]); the main headlight is an ordinary dual halogen lightset above the front window. It is not quite visible in some photos. The LED headlights are just "parking lights." I am attaching a pic where the main headlight can be appreciated perhaps a little better (shown below). Incidentally, the new ADTranz/Talgo electric locomotive for 350 Km/h also has the same kind of White/Red LED arrays for head/tail lights.